This article first appeared in Unlisted, The Edge Malaysia Weekly, on September 14, 2015 - September 20, 2015. Small and medium enterprises (SMEs) may be finding it hard to go global, but they may not know why. At least, this is what The Boston Consulting Group (BCG) and IMD business school believe. In a report titled The Globalization Capability Gap: Execution, Not Strategy, Separates Leaders from Laggards, the global management consulting firm and Swiss business school identify the challenges in taking SMEs global, especially in the case of medium enterprises. Midsize companies, according to the report, face the greatest risk in going global. “They are less nimble than smaller companies and do not have the scale or systems of larger ones,” says Professor Margaret Cording, IMD regional director of Southeast Asia. Large companies do better than midsize and small companies in such core business capabilities as setting up a global supply chain. Scale and experience are clearly to their advantage, the report states. But on the flip side, large companies do relatively poorly on capabilities related to learning and agility. This weakness makes them vulnerable during periods of rapid change, a situation that may be exploited by smaller and more agile local players, according to the report. Small companies, on the other hand, are fleet-footed but have no mastery of local markets and may misunderstand their competitors abroad. The report found that while executives of small companies tend to believe that small and midsize companies are their strongest competitors at home, they see multinational companies as the biggest threat overseas. On a macro level, emerging markets have seen a rise in the past few decades. What was once seen as a source of cheap labour evolved into rapidly growing consumer markets and the growth of capital investment and innovation in these countries. And this is why companies continue to expand on a global scale. Malaysia, riding this wave, is seeing its companies go beyond borders to act on their global ambitions. However, despite a concerted push to expand their overseas presence in recent decades, few companies are ready to build and run truly global organisations and operations. “With globalisation, more opportunities and newer markets have opened up for Malaysia’s midsized companies. 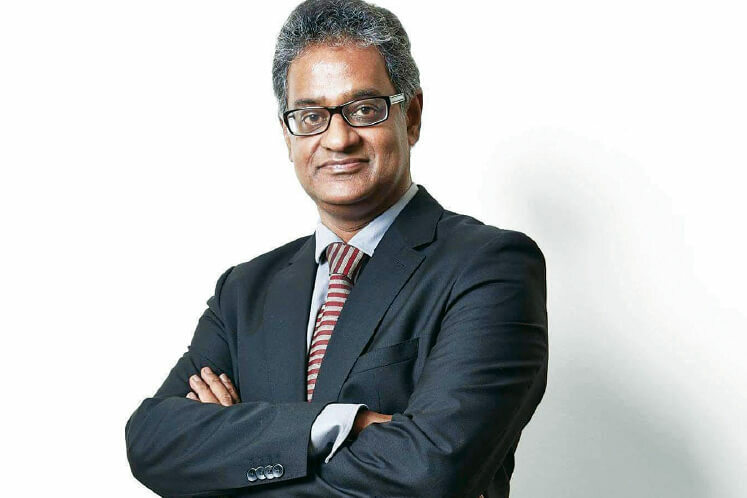 The flip side is that there is also additional competition from foreign companies hungry to get a piece of our local and Asean market,” says Gopi Ganesalingam, Multimedia Development Corporation (MDeC) vice-president of enterprise development. “Thus, the two critical elements for midsized companies in my opinion is their ability to innovate and to value add to existing products so that they are regarded as premium or superior to foreign ones, especially against products from developing countries,” he says. 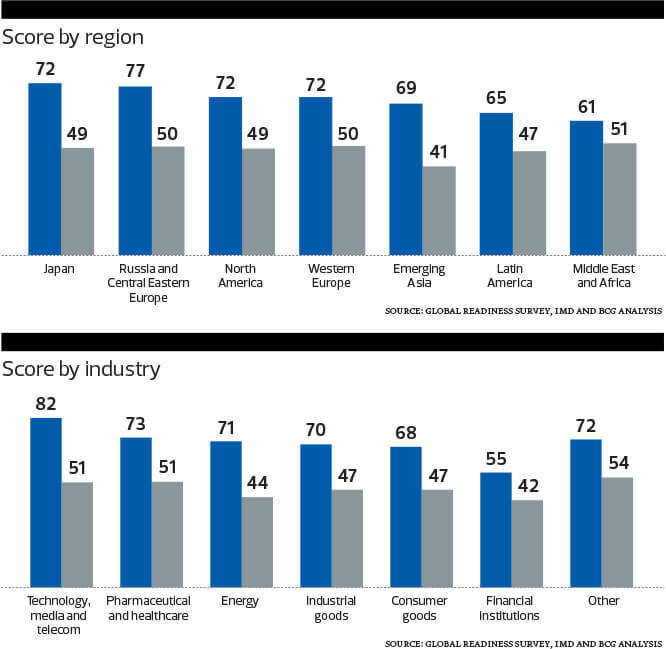 A survey conducted by BCG and IMD found that the average global ambition score for companies surveyed (362 executives were surveyed from a wide variety of companies in Western Europe, North America, Latin America, Japan and Asia) was 72% (where 100% signifies globalisation is a top priority for the company). Out of the companies surveyed, 75% planned to increase the international share of their business. The technology industry was most optimistic about globalisation compared with other industries such as consumer products, industrial goods, media, telecommunications, financial or professional services, healthcare, energy, insurance and the public sector. As identified by BCG and IMD in its report, there are three specific areas companies are struggling with in attempting to go global. Firstly, it is strengthening their business capabilities. Secondly, companies are finding it difficult to align their organisation to support the global agenda. The third challenge is mastering mergers and acquisitions. The first problem identified, which is strengthening business capabilities to suit global needs, relates to supply chain and go-to-market activities. “This is not surprising because these capabilities require large investments, deep experience, intimate local knowledge and strong local talent,” Cording says. The survey respondents say that companies are good at sourcing local talent where available, but the “lacklustre performance in business capabilities suggest that local talent development needs to improve”. “To reap the full benefits of their global agenda, companies need to improve local capabilities, especially the development of local talent," Cording adds. A solution given by the report is that companies should consider bringing on board senior local leaders with strong functional and industry expertise to help with local talent retention. “(Companies need to) develop stronger on-the-ground capabilities and involvement,” Cording states. “Leaders should ask themselves this: ‘Have we reoriented our talent development processes so that local managers are fully committed to the success of their business unit or region? Or do we still use businesses abroad as stepping stones for promising managers from headquarters? Companies should always focus on increasing their headquarters’ exposure to markets abroad, Cording advises. She gives examples of holding board meetings in emerging-market cities and making visits to consumers, customers, NGOs and government agencies. “Some companies, such as hotel chain Starwood, are going even further. Starwood moves its headquarters staff to Mumbai, Shanghai, and Dubai for month-long rotations and has permanently relocated several key staff functions,” Cording points out. According to Gopi, companies in Malaysia should shift their focus onto technology and innovation. “Our local midsized markets should start recognising technology and innovation not as a cost but as an investment, if they haven’t already. [They should] recognise the role of technology as a business enabler and a strategic asset to drive greater productivity, operational efficiencies, operational cost-savings and stay relevant in the marketplace,” he goes on to say. “Entrepreneurs and businesses are now faced with fast evolving technology and innovation on such rapid scale, that if it is not embraced at the right time, businesses can lose their competitive positions,” he adds. Gopi says MDeC is trying to help Malaysian companies stay in the competition through its programmes. Historically, through MDeC, Malaysia has done very well in cultivating an ICT eco-system that has generated close to RM300 billion in top line revenue, almost 150,000 jobs and over 3,600 ICT companies, he shares. “But the time has come for us to shift gears and move some of these forward-looking companies to be global players,” he adds. Thus, the Enterprise Development Programme was created to help companies move up their respective value chains. “Developing local companies to be global players is our biggest challenge,” Gopi admits. According to him, 90% of Multimedia Super Corridor (MSC) companies today have average annual revenue of RM1 million a year, while 8% are seeing RM20 million revenue per year. Only the top 2% of MSC companies bring in RM200 million revenue per year. The programme, he says, has attracted the attention of experienced CEOs to talk to the companies on how best to go global. Meanwhile, MDeC has implemented programmes to encourage local MSC companies to adopt a global mindset. One of these programmes is “best practice sharing”, which entails bringing together companies with good growth prospects with successful ICT companies that have succeeded internationally. “For example, if a company wishes to enter a particular overseas market, we will try to link them up with Malaysian companies or Malaysian businesspeople who have made it there, via merger and acquisition activities for new regional footprints, says Gopi. MDeC also assists local companies with a “technology refresh”, where companies reevaluate their technology, with global tech players by introducing new modern funding platforms and agencies tasked to grow forward-looking companies. “In other words, our enterprise development unit was created to identify companies with high potential of crossing the RM100 million revenue mark, and transforming them into stronger global players, while still maintaining the Malaysian brand,” Gopi says. The bar for successful globalisation is rising. It’s not enough for globalisation to be a priority. “Senior leaders need to ensure that their companies embrace globalisation as a live-or-die proposition. For many companies, the stakes are that high,” Cording points out. Therefore, it is absolutely vital that companies align their organisation internally to meet the global agenda. 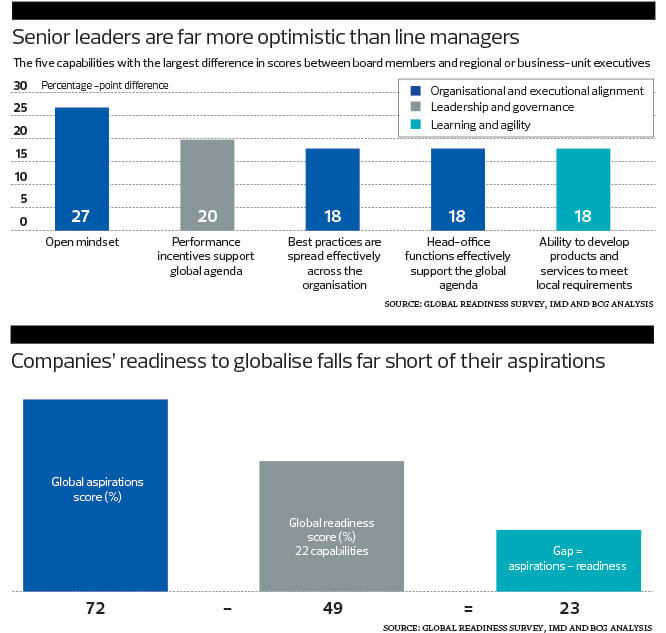 The report reveals that executives at headquarters have a far more optimistic view of their companies’ globalisation readiness than executives working in the field. “This disconnect suggests either that executives working within the business units and regions are too caught up in their daily chores to see the overall progress of the company or that headquarters staff are out of touch — or both,” Cording says. Sometimes, executives at the headquarters often overestimate the readiness and what is required for globalisation. Cording says that senior management is often good at prioritising global activities but does a below-average job of funding these projects. “In other words, they talk the talk but don’t fund the walk,” she adds. Stark differences in perception between headquarters and the business units should serve as a warning sign for senior leaders, she says. “Likewise, headquarters staff support the global agenda but fall short in spreading best practices related to globalisation throughout the organisation,” Cording charges. Execution of best practices is something that will make a big impact on the performance of business abroad as companies run into highly competitive local companies, she says. In fact, the report shows that one third of respondents consider small to midsize local players their fiercest competitors. In some industries, such as industrial goods, more than 40% of respondents are most worried about local competitors. “Small and midsize local companies are less complex and place a greater focus on executional excellence. They are agile, efficient, and responsive to local customers,” Cording says. “In many emerging markets, these local companies, which we call local dynamos, are often able to outgrow multinationals by 25 percentage points annually,” she shares. As such, she believes it is pertinent that senior executives set clear operational targets, monitor progress as well as provide funding. There must also be a whole redesign to the reporting relationships between regions and the headquarters, says Cording. While the headquarters effectively supports the global agenda, provides leverage, exploits the global scale, and impose strong governance, it needs to also leave room for adaptability, nimbleness, speed, and authority in local markets. Many companies still try to improve the performance of their overseas businesses from headquarters, she says. “They conduct product and market analyses and determine budget allocations for business units and regions but this can backfire when the business units are competing against strong local companies and need more authority to make faster decisions,” she opines. In these markets, Cording says it makes more sense to conduct analy-ses and determine needs at the local level and then define the role that the central functions can play. Local leaders are the best people to decide which types of innovation and which go-to-market approaches are required. “Develop geographic diversity among senior management,” she advises. In many companies, an international assignment is an essential way station for rising stars. But these episodic postings do not necessarily create champions for overseas markets, she warns. “Companies should develop actual diversity in their senior management teams. Their goal should be to have several C-level executives who have built their careers around success abroad,” she adds. Of course, management at the headquarters still have to make tough decisions in allocating scarce resources among competing local businesses and regions. But they need to see their role as supporting the business units, not merely overseeing them. A successful example of globalisation is Japanese pharmaceutical company Takeda, says Cording. It grew internationally between 2005 and 2011 through acquisitions in Europe and the US. As part of its transformation into a more global company, Takeda made changes in the company’s structure by moving core business functions out of Japan. This sent a strong signal that the company was becoming less Japan-centric. “It reinforced this view by naming non-Japanese executives as chief financial officer, chief HR officer, and head of business development. The company also overhauled HR policies and systems to support the new global orientation,” Cording adds. Successful M&A deals allow companies to acquire market share and a global footprint, diversify their talent base, and create a more varied portfolio of businesses. Cemex, for example, has evolved over the past 30 years from a midsize Mexican concrete manufacturer into a global leader through a series of acquisitions. Along the way, it codified a set of steps for PMI. During integration, the company rapidly rolls out highly standardised core processes but also identifies those practices of the acquired company that should be shared. Cemex staffs its integration teams with high-potential junior managers who try to strike the right balance between efficient integration and an open mindset.